We just posted all upcoming events on the left hand side of this page. We invite you to join us at one of the open houses in the upcoming month and experience this this one-of-a kind blend of design and performance. 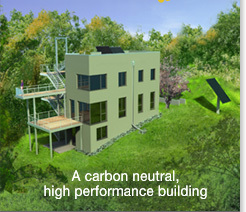 The Passive House in the Woods can be heated with 2 hair dryers, it is incredibly air-tight and super-insulated. It makes more energy than it consumes, and it offers stunning views of the St. Croix River valley—all a stone’s throw from the Twin Cities. Experience We will see you at the house.